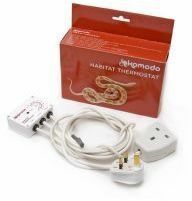 Komodo Habitat Thermostat The Komodo thermostat is designed to be used with the Komodo Dome Light Fixture or Komodo Heat Mats but will operate most heat sources, including lamps, heat mats, cables and ceramic heaters, etc., providing they do not exceed 300 watts and 3 amps. FEATURES  Perfect for reptile and amphibian care.  Controls most heat sources including incandescent lamps, heat-mat and ceramic heaters up to 300 watts.  Adjustable tamper-resistant temperature dial.  Guaranteed +/- 1 degree Centigrade accurate at the probe.  Precisely monitors air or surface temperature.  Audible and visible operational indicators.  3 pin socket for easy connection to the thermostat.  Accurately controls the thermal gradient.  Designed to operate in all reptile environments from desert to rainforest.